The Cheese Skirt on my Squeezeburger has a piece of bacon for good measure. I ordered the Famous Squeezeburger w/ cheese and bacon ($8.59). It has Mayo, mustard, dill pickle, tomato, onion, lettuce. I ordered my onions grilled. The burger has 1/3 lb patty on sesame bun. I also ordered the combo fries and onion rings. $3.99. The Squeeze in is a very friendly place walking in. When I had arrived the server proudly told me they were famous from a stint with Guy Fieri on The Food Network. The owner Dean, came over and said hello. Another nice touch is a photo of Kramer from Seinfeld on the wall. The onion rings and fries are hot and ready to munch. The Burger is awesome. It has a fluffy but solid sesame bun. Everything was hot off the grill with a great mix of mayo, mustard and onions. Dill chips were cold and crisp, the green lettuce fresh. The cheese skirt is like cheese chip on the side and spread several inches in all directions beyond the bun. I love breaking a piece off and tasting the sharpness of the cheese. The bacon was salty and firm, almost crisp and a nice compliment to the taste of the cheese. Fries are medium cut. Hot and good. Onion rings were hot, beer-battered and crisp. Sweet inside. If you are in Tracy, skip In-N-Out, Five Guys, Nations, Sonic, Jack-in the Box and go to Squeeze Inn for a real burger of unique character. The Belcampo Burger is 5.6 oz of dry-aged beef with NY cheddar, caramelized onions, butter lettuce and house sauce for $11. HBB Note: My friend Gil Zeimer and I enjoyed this burger recently at Belcampo. Gil, a writer by trade, had been bugging me to post. Thankfully for us burger lovers, he finally got tired of waiting and wrote it himself. The burger is great. I agree with the rating he assigned it. Enjoy the review and the burger! There’s meat. And there’s sustainably grown, stress-free, organic-certified meat 100% from a butcher shop restaurant’s own land near Mt. Shasta. That’s the unique selling proposition at Belcampo Meat Company in Larkspur, CA, a short walk from the Golden Gate Ferry terminal and a recent addition to the Marin Country Mart. 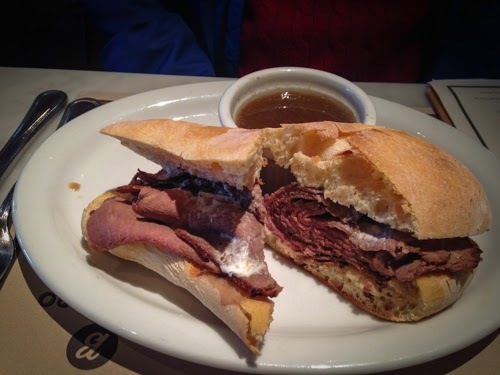 The French Dip features medium rare roast beef with creamy horseradish on ciabatta. And, of course, hot jus. So does all of this TLC get handed down to the pasture-raised meats in the Belcampo Burgers? Pretty much. 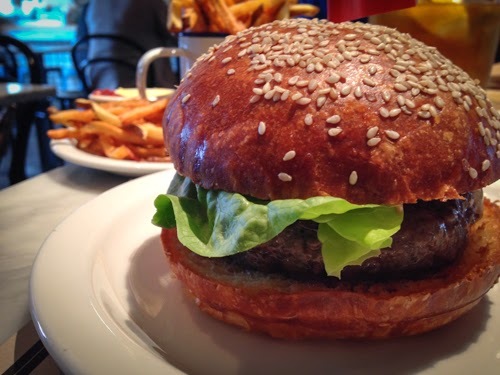 The Belcampo Burger ($11) that Scott (HoosierBurgerBoy) ordered was sandwiched between a tender brioche bun –– succulent, medium rare, and perfectly grilled. While I’ve enjoyed the burgers here on several other visits, I actually prefer the French Dip Sandwich ($12) because the rare roast beef and its au jus were the most fragrant and delicious I’ve ever had. We also ordered the French Beef Tallow Fries ($7), which were thinly cut and a bit salty, but quite tasty. Not in the mood for beef? This restaurant also offers lamb, pulled pork, chili cheese fries, and quite a few salads. The adjacent Butcher Shop offers steer, bacons and sausages of the world, ground beef, double cut steaks, goose and duck. If you’re traveling throughout California, there are other Belcampo Meat Companies in Palo Alto, Santa Barbara, Santa Monica, and Downtown Los Angeles.